The world of the occult is causing chaos across the land and you’re charged with combating some strange creatures to save humanity. Click here to play! If you’re successful in this task, you’ll definitely receive a hefty payout. As there are plenty of creepy creatures stalking the earth, you’ll want to start with some of the less intimidating. Capture as many bats as possible as these winged creatures hold the top payout of the game. Two to five of them across an active payline to win up to 5,000 times your line bet. You’ll also want to gather up all of the rats and spiders as these to creepy crawlies will get you a top payout worth up to 100 and 50 times your line bet respectively. There are a few other symbols to help you in your quest to conquer evil, including crytal balls and spell books. These two symbols will pick up a top payout worth 3,000 and 1,500 times your bet respectively. Other symbols include masks, candles, bonues, and strange statues. Keep a close eye out for vamps, mummies, and werewolves, as all three of these symbols are special. The vamps are bonus symbols, which will trigger a bonus game. 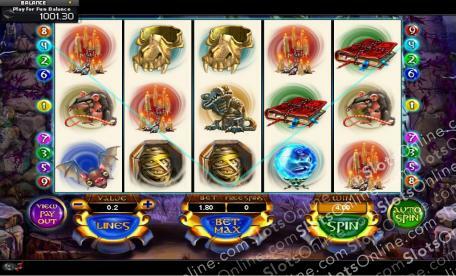 The mummy is a scatter and will trigger a number of free spins if three or more are spun anywhere on the board. Finally, Weres are a wild that will substitute for most other symbols to help you bring in the big wins. So, go on the hunt for all of the spooky creatures that stalk the night. Slay them all for a chance to collect some very big wins. The monsterous mummy is a scatter. Spin three or more of these bandaged creatures anywhere on the board and you'll be rewarded up to 10 free spins. The werewolves are a wild symbol. These will replace all others, excluding bonuses and scatters, to help you create more winning combinations. Three or more vampires anywhere on an active payline will trigger the Shady Conquest bonus round. During this game, you will have to choose from a selection of scary icons to reveal your bonus prizes.